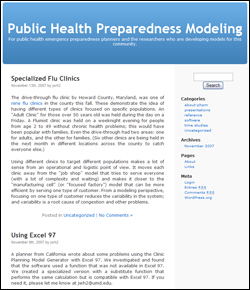 Associate Professor Jeffrey Herrmann (ME/ISR) has developed the Public Health Preparedness Modeling blog to support public health emergency preparedness planners and the researchers who are developing models for this community. Herrmann has a background in operations research and industrial engineering. His public health planning research concentrates on models of mass dispensing and vaccination clinics, also known as "points of dispensing," or PODs. His Clinic Planning Model Generator software creates a Microsoft Excel workbook for POD planning. Public health planners in 25 states have used the software to evaluate and improve their POD plans. This work is sponsored by the Montgomery County, Maryland, Advanced Practice Center for Public Health Emergency Preparedness and Response. Other models for planning POD operations have been developed as well; all are available at the project web site. Herrmann hopes members of the public health planning community will find the blog a useful tool to build community and share information. He welcomes comments about emergency preparedness issues and particular models.